The Julidochromis group is a collection of African dwarf cichlids endemic to Lake Tanganyika. Julidochromis cichlids are affectionately referred to as “Julies” and are very popular among aquarists. Their formal name, Julidochromis, is derived from two words. “Julidini” is the name of a group of marine wrasses and “Chromides” was formerly used as a name for cichlids. The group also includes several subspecies, which actually might be their own species but have not been recognised as such yet. 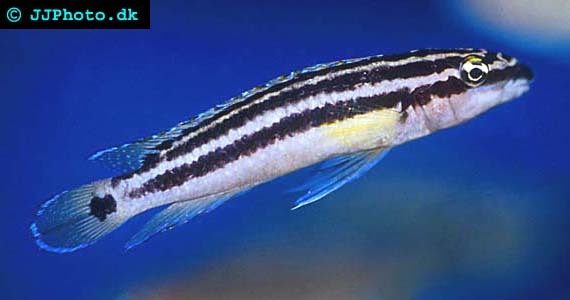 Examples of Julidochromis subspecies are J. Regani affinis, J. Regani kipilli and J. Transcriptis gombi. Lake Tanganyika, the natural home to all the Julidochromis cichlids, is a rift lake divided between four African countries: Zambia, Tanzania, Congo and Burundi. With its 650 kilometres it is the longest lake on the planet. It is also the second deepest lake in the world and reaches down to 1433 m. Below 200 metres Lake Tanganyika is however almost completely without living organisms, since the oxygen levels are to low to support life at those depths. Lake Tanganyika is remarkably stable in terms of water temperature, and the water far below is no more than 3 degrees colder than the constant 26.6 C found at the surface. Lake Tanganyika is filled with a huge number of endemic species, particularly cichlids. The Julidochromis group is just one of many. As mentioned above, the Julidochromis species are very popular among aquarists. This comes as no surprise since Julidochromis cichlids are very beautiful and also tough and easy to keep. They will readily accept most types of food, and since they are rather peaceful creatures they can be kept with many other fishes in a community aquarium. They usually stay between 8 and 15 centimetres in length, and will therefore not require very large aquariums. A 60 centimetre long aquarium is enough if your wish to keep Julidochromis cichlids.